The structural design of RISE itself was carried out by structural engineers specialising in the design of geometrically challenging structures. RISE is a unique manifestation of the form, with its pair of concentric spheres supported on tangential and normal columns. 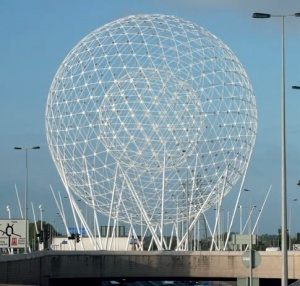 However, through efficiency of design and selection of a favourable geodesic scheme, the structural fabric of the sculpture was optimised to consist of a relatively small number of fundamental components. Over 4,000 components, connected with c10,000 bolts, were distilled down to less than 60 individual types. This standardisation allowed the steelwork contractor to focus on delivering the level of accuracy required to ensure that every member would adopt its correct position on the surface of each 'sphere'. To ensure continuity from the sculptor's design models right through to the finished structure, StruCad's import features were used to take in centreline geometry from the structural engineer's master model. 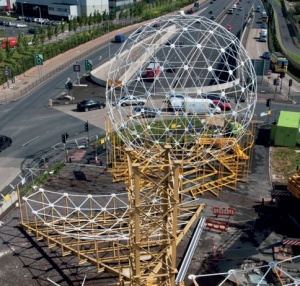 This geometry formed the basis of numerous subsequent [[Modelling_and_analysis|models] used to fabricate the structural fabric of RISE itself, as well as a complex array of temporary works, lifting frames and installation aids deployed on site to enable safe and accurate erection of the work. 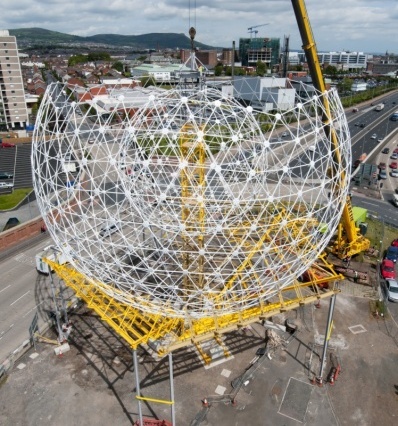 As detailing of the structure progressed, 3D geometric modelling techniques were brought to bear on some particularly challenging aspects, such as the optimal degree of dishing to be applied to the circular node plates which hold the spheres together. The interaction of the two spheres, the supporting columns and surrounding bed of steel 'reeds', all coated in brilliant white, has created varied and dramatic views. Steelwork Contractor M Hasson & Sons Ltd. Linking two distinct Belfast communities, this is a stunning and popular landmark .